The North Fork of the Stanislaus River was planted just before Labor Day and fishermen are still catching limits of rainbows. I have attached a photo of Kevin Rodrigues and his 4lb Brown Trout he caught using a Rapala. Bait casters should try inflated nightcrawlers,salmon eggs, Gulp Power Eggs, and floating Power Eggs. Power Bait has just released their new scents for 2010. They now have salmon egg scent, and garlic in the popular colors, along with the new hatchery pellet scent, and green pumpkin. Lure casters should try Panther Martin's, Rooster Tails, Kastmasters, Blue Fox spinners, and Rapalas. Fly fishermen should try bead head nymphs,parachute adams, female parachute adams, parachute blue dun, parachute light cahill, ants, woolly buggers, stimulators, and caddis flies. The bite usually comes on early in the morning or later in the evening. You can check the flows at dreamflows.com. Spicer Reservoir was excellent this past weekend for trollers, with limits being caught.Trollers should try Apex, Needlefish, Wedding Rings, Glitter-Bugs, Rapala's, Ex-Cell spoons and Rocky Mountain Lures behind a small dodger, Wild Thing dodger, Panther Martin Lake Trolls, or the new Glitter Bug dodger,and the Rocky Mountain dodgers, tipped either with a nightcrawler, Gulp Nightcrawler, Gulp maggots, tthe new Gulp Corn, and Power Minnows. You can also try using just a dodger trailed with the nightcrawler. Make sure to use scent to increase your catch. The better fish have been caught around 40 feet. Make sure to troll slow.The lure fishermen have been doing good using Panther Martin spinners, Rooster Tails, Blue Fox spinners, flies on a bubble, and Kastmasters.Try fishing around the dam and up by the buoy markers as the water is the coolest at those locations. Fly fishermen should try woolly buggers, ants, caddis, bead head nymphs, hoppers, and crickets.The fish have been loaded with ants and assorted bugs. Bait fishermen should try Gulp Eggs, Gulp Nightcrawlers, Garlic and Salmon Egg scented Power Bait, inflated nightcrawlers, and floating Power Eggs using a cast-a-bubble with a 24" to 30" leader or a sliding sinker rig. Big Trees State Park is located on Highway 4 approximately three Miles above Arnold. You can contact them at 209-795-2334 or their website www.ca.gov and go to Calaveras Big Trees. There is also Golden Pines RV Resort for additional RV camping. Their website is www.goldenpinesrvresort.com. The campground at Sourgrass is now open along the North Fork of the Stanislaus. Union Reservoir will be planted this week. Bait casters should try using the new Power Bait scents, Garlic and Salmon Egg, Gulp Power Eggs, floating Power Eggs, and inflated nightcrawlers. Lure casters should try Panther Martin's, Rooster Tails. Fly fishermen should try woolly buggers, sparrow nymphs, adams, caddis, and bead head nymphs. White Pines Lake located near Arnold has slowed but fishermen are still catching limits early in the morning and late evening as the lake warms fast during the day. There are still some beasutiful rainbows in the lake as the lake was planted heavily this season. Bait fishermen should try floating Power Eggs, Gulp Eggs, new Salmon Egg scented power bait, new Garlic scented Power Bait, Gulp Power Bait, Gulp Nightcrawlers, salmon eggs, and nightcrawlers using a cast-a-bubble and a 30" leader or a sliding sinker rig or try using a cast-a-bubble. Fly fishermen should try bead head woolly buggers, ants, blue wing olive, adams, stimulators, parachute flies, and sparrow nymphs on a intermediate line or try using a small split shot to get down to the fish. Lure fishermen have been using Panther Martin's, Kastmasters, and Rooster Tails. 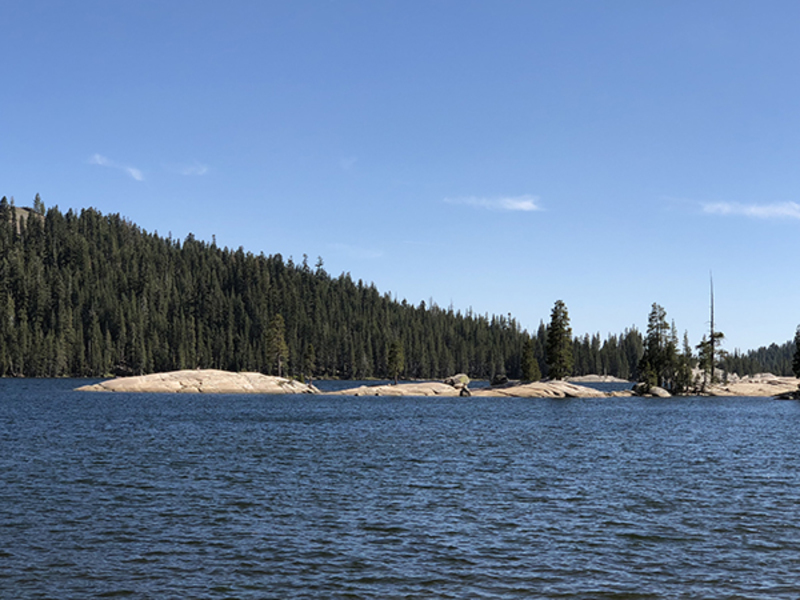 Make sure to check with the Forestry Department at Lake Alpine 209-753-2811 or at Hathaway Pines 209-795-1381 for current campground information. Highland Lakes is still pumping out some beautiful limits of wild brook trout. Lure fishermen should try Panther Martin's, Kastmasters, and Rooster Tails. Bait fishermen should try crickets, inflated nightcrawlers, Gulp Power Eggs, and the new Garlic and Salmon Egg scented power bait. Fly fishermen have been doing excellent using woolly buggers, adams, mosquitoes, caddis, and bead head nymphs.